The early 1500's, mid-Renaissance, was in many ways the beginning of knowing the body through dissection, i.e. anatomy (literally: to cut up). 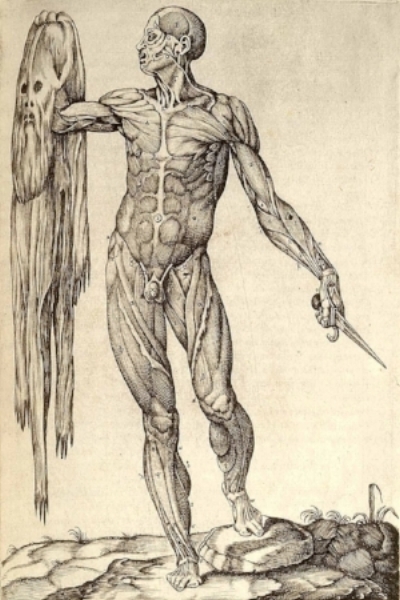 The work of Andreas Vesalius, oft' referred to as the father of modern anatomy, as his contemporaries, like this anatomist, Juan Valverde de Amusco, who made this artful rendition of man comtemplating himself from outside. I was the student, again, of this episode's guest all last week in AZ in a fresh-tissue cadaver dissection. By popular demand, and my own great interest, Tom Myers returns to The Body Awake for a second interview. the nature of fascia as the body's very under-mapped "biomechanical autoregulatory system"